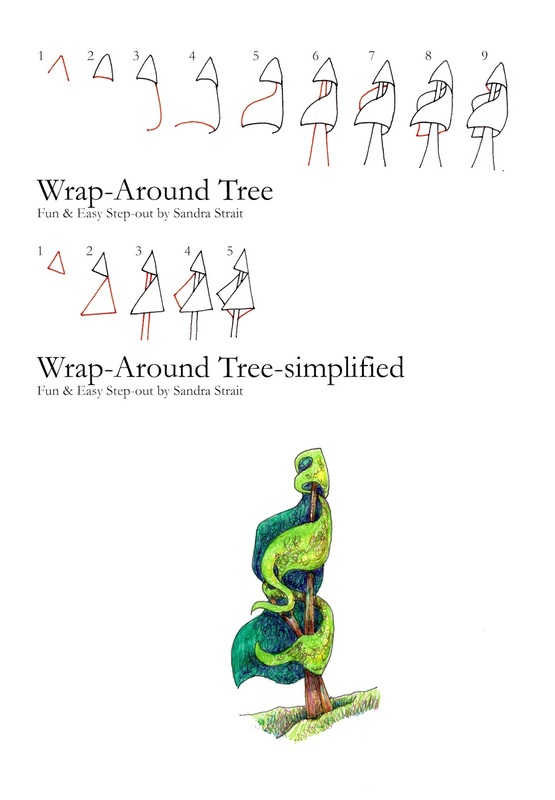 The Wrap-Around Tree is an example of a simple drawing that can be hard to do. It’s the curves that are likely to throw you. The experienced artist won’t have much of a problem. But for someone who hasn’t drawn freehand very often, those gentle sweeps and curls can be hard. Face it, most of the time we are trying to get a straight line. When we sew, when me measure, cut – almost always, we are trying to get a straight line. Then you sit down to draw, and – what’s this? Sweeping and swerving all over the place when you’ve spent your life trying to avoid that? I do urge you to try those curvy lines. It can take some practice, but will enrich your drawings and I think it also means you’ve let go of a certain mentality – for the moment – and let yourself just flow. It can be both relaxing and energizing. But, frustration doesn’t help in any way. So I’ve done a simplified step-out, using just straight lines. If the curves throw you, use the simplified version. Once you are familiar with drawing the tree itself, then go back later and try the curves again.